A heating system for a building in which the heat-conveying medium is hot water. A hot-water heating system consists essentially of water-heating or -cooling means and of heat-emitting means such as radiators, convectors, baseboard radiators, or panel coils. A piping system connects the heat source to the various heat-emitting units and includes a method of establishing circulation of the water or other medium and an expansion tank to hold the excess volume of water as it is heated and expands. In a one-pipe system, radiation units are bypassed around a one-pipe loop. This type of system should only be used in small installations. 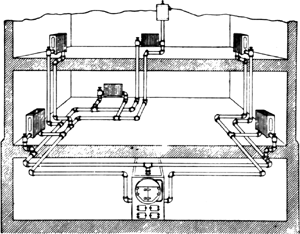 In a two-pipe system (see illustration), radiation units are connected to separate flow and return mains, which may run in parallel or preferably on a reverse return loop, with no limit on the size of the system. In either type of system, circulation may be provided by gravity or pump. One outstanding advantage of hot-water systems is the ability to vary the water temperature according to requirements imposed by outdoor weather conditions, with consequent savings in fuel. Radiation units may be above or below water heaters, and piping may run in any direction as long as air is eliminated. Hot water is admirably adapted to extensive central heating where high temperatures and high pressures are used and also to low-temperature panel-heating and -cooling systems. A heating system in which water having supply temperatures lower than 250°F (121°C) is used as a medium to convey heat from a central boiler, through a piping system, to suitable heat-distributing means. VVH can be an efficient and inexpensive alternative for hot-water heating systems, especially for retrofitting old steam heated buildings (Zhadanovsky 2012). With a full basement he's heating 3,600 square feet, so like it or not, he's pretty much married to his in-floor hot-water heating system. Venturing out of the backwoods can your off-grid home survive without you? Just because the hot-water heating system has been operational for several years, don't assume all of the components are working. Unlike hydronic towel warmers, which must be plumbed into a hot-water heating system, this electric towel warmer simply plugs into any standard 120-volt outlet. When installed as a hot-water heating system for radiant in-floor heating, a geothermal system can only heat water to 110-120 degrees, so for most homes it will require some amount of boiler-heated water on really cold days, though overall it should handle 80 to 90 percent of the heating chores over the course of a winter. On the back of strong demand for hot-water heating systems in Europe, the new company will also focus on the sale of heat pumps, in addition to air conditioning and refrigeration systems, it said. In the European market where demand for hot-water heating systems is robust, MHIAE will not only market heat pumps and other high-efficiency equipment, but also introduce optimal equipment combinations suited to each customer's operating environment and usage conditions. 2]-based hot-water heating systems (based on a heat-pump) for Japanese domestic use. When meeting with clients to design electrical or hot-water heating systems, McKay takes into consideration their lifestyle choices, budget, personal preferences and appliance choices. Because of this system's complexity and cost, it's unlikely to replace steam or hot-water heating systems used to warm buildings.